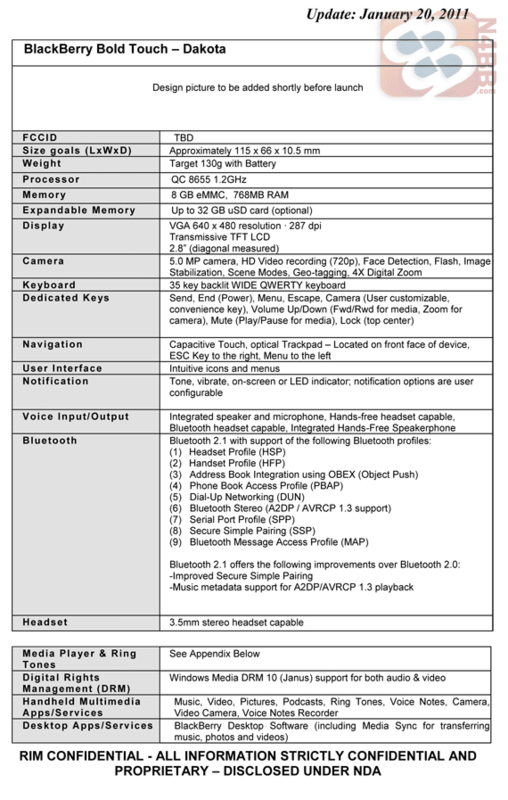 This upcoming Blackberry Bold Touch Dakota 9900 has great specs. According to this table by N4BB, the Torch 2 is to have a 1.2GHz Snapdragon processor, 8GB of internal storage and 768MB of RAM, a microSD expansion slot, 5 megapixel camera and a 35-key backlit keyboard. RIM’s BlackBerry Torch 2 is also to feature a microscopic 2.8-inch LCD with a 640 x 480 resolution, a 1239 mAh removable/rechargeable battery, and will support BlackBerry 6.1 Applications.